Skin Euphoria is a Newcastle upon Tyne based company that are specialist in advanced skin care treatments. Skin Euphoria contacted us to develop a brand and marketing material for their new company. Alongside the logo, brand design, printed stationery and a responsive website, they also required social media set up and training as part of their ongoing marketing strategy. We worked alongside Julie, the director of Skin Euphoria, to develop a brand and marketing material that reflected the clean and simple image that she wished her company to portray. 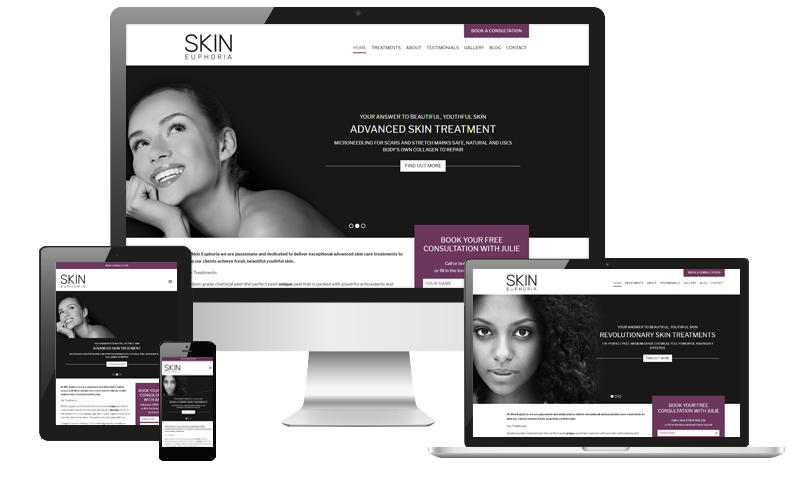 The website was designed with bold imagery in mind, as it was felt that this was the best way to highlight the services that were on offer by Skin Euphoria. The site was built using WordPress which gave them full control over all the images that were displayed on the site as well as the content. It was also developed with a blog, which allows Skin Euphoria to share tips on skin care, latest techniques that they use and customer reviews.